IKEA MAMMUT children's table and stools, used. Selling $20, self collection @toh guan road, Jurong east, s600267. SOLID WOOD BABY COT Widest width : 78.5 cm Longest length : 137.5 cm Highest height : 101 cm No delivery provided. SOLID PINE WOOD SHELF Widest width : 38cm Longest length : 185cm Highest height : 200cm No delivery provided. Single bed frame with drawer for storage + mattress included for $250. Without mattress will be $200. Negotiable. Good quality wood, item has been used for less than a year. The bed is still strong and sturdy! Please contact for more details. 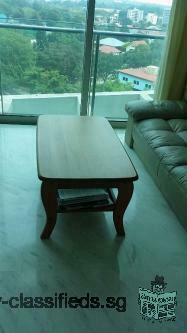 Hi there, Selling a 5 month old brandew condition marble dinning table comes with 6 chairs. In excellent condition and marble top protected since day one. Pick up at Jurong east. Brandnew selling at $950. IKEA 2 seater sofa in brown Color. Excellent condition! Stainless.Just used for 1-2 years not very frequently. IKEA Book-Shelf in excellent condition! FOR SALE - 2 Sets of Picket & Rail bunk beds in dark wood finish including new mattresses, cost SGD $900 each, can sell for SGD $300 each (self collection). Anyone who's interested can call Stephen Gough for more details. Thank you! MID-CENTURY DRESSING TABLE in ELM WOOD -FREE DELIVERY! W 107 x D 40.5 (top slot 12cm) x H 175 cm. Excellent condition & sturdy for a mid-century furniture. Please refer & enlarge shown on the images here. WApps now for fast deal with free delivery! Designer Recliner Sofa for sale.Bought $1800 from Park Mall 3 years back.For guests room use only.So the condition is good.Now selling $480 to make space.Price nego. Whatsapp if keen. One piece of antique French queen size bed frame for sale. Mattress is not included. It has been dismantled and wrapped up for easy transport. Interested please sms/call. Thks.